By now you know that in order to reach anyone on Facebook, you need to open up your wallet. Whether it’s people in your fan base, or people whose interests indicate they should want to work for you, a talent acquisition strategy that uses Facebook without a promotion strategy is like buying a BMW and not bothering to put any tires on it: it may seem like a lot is happening from the driver’s seat, but you’re not making any progress. So we’ve developed four rules that will help ensure that the money you are paying Facebook to promote your post is actually being used well. Follow these rules and you can be sure your message will be hitting more of the kinds of people you really want to reach. These rules are focused on boiling your audience segment into one where your single specific message will have the best chance to compel someone to act. Let’s say you’re looking to hire some programmers. You might just assume that you go into Facebook’s targeting tool and add all the terms you can think of that someone who programs might add to their Facebook profile and be done with it. But you may now be pushing your message to about a million possible people in the US alone. Unless you’ve got a Super Bowl-sized budget in your wallet, you won’t reach all of these people. Your $500 promotion budget will reach a very small fraction of this audience. Unless you’ve got a Super Bowl-sized budget in your wallet, you won’t reach all of these people. So what? You might think that since everyone in your audience is probably a programmer, what’s the issue with only reaching some of them? They all share the same interests, so they must be driven by the same message, right? In the above example, if you only have $500 to promote that post (and let’s not kid ourselves: $500 is a sizable budget for a single post; most of us will be working with around $100 per post), you might only be reaching 10,000 programmers. That’s about one percent of your total audience. What if everyone in that 10,000 lived in New Jersey? Or what if they were all women? Or what if they were 18 years old? What if they all were interested in C++ or Java? Does it suddenly feel like your segmented audience isn’t all that segmented? I would wager that you’ve got an image in your mind of what this programmer looks like, and you build an audience segment based on that image’s interests. That’s fine, but there are going to be many, many more people who aren’t what you pictured who fit within that segment, and you are spending money to talk to them. Worse yet, unless you’ve really narrowed down your segment to the size where your promotion budget can reach many (if not most or all) of them, you likely aren’t even reaching the person you thought you were. The two easiest ways to narrow down your target audience are to focus on gender and age. Your first instinct might be to say, “But we can’t discriminate against age or gender.” And you can’t. That’s why you make one ad for men and another for women. You make one ad for people aged 22-26 and another for those aged 35-45. The utopian goal of any online marketing campaign is to create a one-to-one relationship, where every message is custom-designed for each individual and their needs. Since it would be time-consuming to build a few thousand messages for a few thousand targets, you narrow the target audience to be small enough that a single message can resonate. The ad you write for a 25-year-old programmer is one for an entry-level person, and the message can be about the chance to work with cutting-edge tech. The message you write for the 35-year-old programmer can be one about career paths. The message you write for the 45-year-old programmer is going to be about your work/life balance. If you follow these rules, your Facebook promoted posts will see a far higher conversion rate. And if you don’t think you can write specific posts for the different genders because the message should be the same, look at nurses and programmers. These roles have a very lop-sided gender spilt. For example, you can talk to female programmers about how important women in technology roles are to your company, and talk to male nurses about how you are creating a gender-neutral nursing department. These messages will fall on deaf ears for most male programmers and female nurses. By now you’ve realized that if you follow these four rules, there is a fifth rule to follow: Create different versions of ads and posts for each segment. 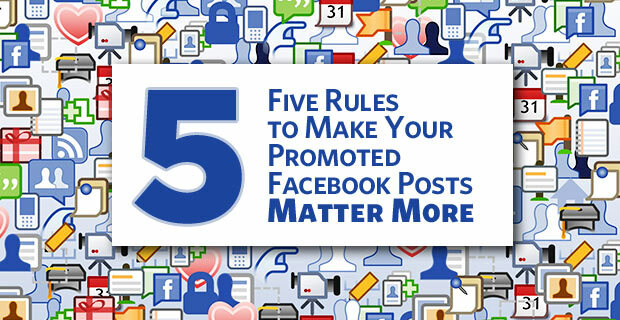 So if you follow these five rules, your Facebook promoted posts will see a far higher conversion rate, drawing more people to your career site who are more interested in learning more about you and applying. Excellent piece! I’m wondering, though, how effective it is to target one gender at a time? Of course, it has its segmentation benefits but it might be difficult to convince someone to essentially double their budget (assuming that most people consider all genders under one ad). Now, they’ve split up one ad into two and that’s a difficult sell for smaller budgets. Perhaps testing it and comparing the effectiveness in the name of trying something new is the way to go about that.